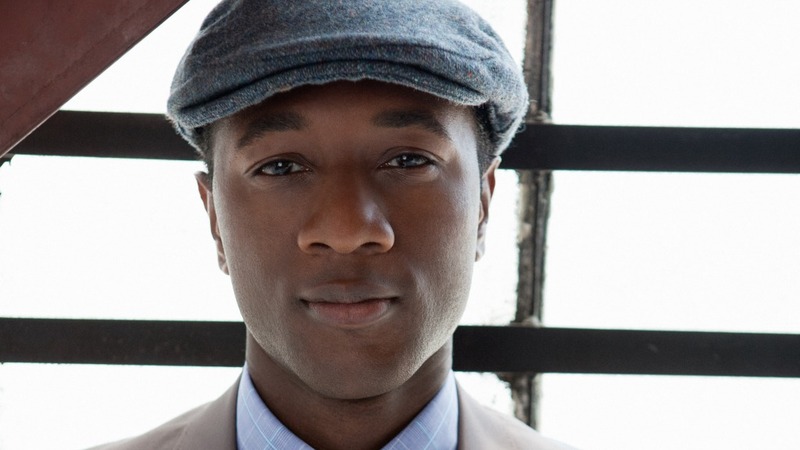 Over his decade-plus career, Grammy-nominated singer, rapper, and songwriter Aloe Blacc has racked up radio hits, like 2013's "Wake Me Up," his collaboration with Swedish producer Avicii. But Blacc has also tilted his soulful songs in a socioeconomic direction, with perceptive, chart-vaulting releases like 2010's staccato mantra "I Need a Dollar" and his latest single, "Let The Games Begin," from the recent film "Race," about Olympic athlete Jesse Owens. A native Californian, Blacc, who was born Egbert Nathaniel Dawkins III, has also long admired another man who changed his name for his music: Stevie Wonder. Poignantly in early May, Blacc joined Wonder, Faith Evans, Eric Benet and others in Los Angeles for a tribute to Prince. There is no justified way to narrow a career that has spanned a half century and hundreds of recordings down to only five albums. I've been touched, moved, inspired, and educated by Stevie Wonder's brilliance since the first time I heard his razor-sharp vocals and laser-focused synthesizers cutting through the speakers as a young child in the '80s. What follows is my take on the essential works of a world-class musician and songwriter who's exhibited nothing less than genius in his compositions and arrangements. Especially those from 1971-1980. The opening song, "Look Around," is a personal favorite with its haunting chords and chilling lyrics that shine a spotlight on disharmony in the world. It sets the tone for an album that is more of a socially-conscious body of work than any of Wonder's previous or subsequent albums; it was released around the same time as Marvin Gaye's groundbreaking album of similar theme, What's Going On. The song on this album that has had the biggest impact on me is "Never Dreamed You'd Leave in Summer," which pulls at every string tethered to my heart. This song is credited as a co-write between Wonder and then-wife Syreeta Wright, as were all the other songs on the album. I can only imagine what another album written by the pair would have sounded like had they remained together. When it comes to timeless songs, Wonder has no shortage of them. "You Are the Sunshine of My Life" is just one of his many recordings that has continued to stand the test of time. It's amazing to hear the breadth and depth of his talent on this album. This is highlighted by the dramatic difference between the sound and style of each song. Another classic from this album is "Superstition," which is essential for any audiophile's catalogue. This is by far my favorite Stevie Wonder album. I like an album that shares points of view that you can assume belong to the artist and where you can suspend your disbelief and dive into the world they've created. However, it's a much better sell if you know for sure that the artist has lived the experiences and stories. In this album we get a sense that Stevie has lived a lot. The music is rich and the lyrics paint detailed pictures of love and strife. "Living for the City" shares a powerful story of the African-American struggle in the migration from Southern plantations to northern cities. "Don't You Worry 'Bout a Thing" is a Latin-tinged groove of reassurance. I love how Wonder could lift your spirits from despair with rhythm and soul. Other notable songs from this album include "Too High," "Golden Lady," "Higher Ground," "All in Love Is Fair" and "He's Misstra Know-It-All"
Almost twice as long as his previous albums and almost completely self-written, Wonder enlisted a league of distinguished musicians to round out the production and sound. Decades before hip hop's finest emcees were shouting out their colleagues, Wonder pays tribute to the greats of jazz music by naming "some of music's pioneers that time will not allow us to ignore." Hip hop's relationship to Wonder has helped to refresh our memories of his greatness time and time again. "Pastime Paradise" was famously sampled for Coolio's "Gangsta's Paradise" and the list of samples, interpolations, and allusions goes on. Other favorites from this magnificent work include "I Wish," "Isn't She Lovely," and "As." I've taken cues from greats like Wonder to use my artistic voice for positive social change. Wonder's personal investment in the campaign to make Martin Luther King, Jr.'s birthday a national holiday culminated in the recording of "Happy Birthday," to promote the cause. His relationship and admiration of reggae and Bob Marley lead to a shared tour and "Master Blaster (Jammin')," an homage to Marley's classic song "Jammin'." I love every song on the album but I always play "All I Do" and "Lately" a little more than the others.